The BDI has been on a slide lately prompted by several issues plaguing dry bulk demand. Some are temporary, while others look to be long term shifts. Here we will review the major demand side shifts in an effort to determine which classes are impacted and for how long. Note: This article was originally published March 3rd on Value Investor's Edge, a Seeking Alpha subscription service. The decline in the Baltic Dry Index, BDI, this year is the worst on record, with the exception of the calamitous drop in the wake of the collapse of Lehman Brothers 11 years ago, according to data from Alphabulk, part of AXS Marine. Several factors leading up to this have already been discussed in recent exclusive reports on Value Investor's Edge; a slowing Chinese economy, the ongoing trade war, waning iron ore demand, coal import bans, etc. However, some unforeseen events, like the Vale dam disaster could have not been predicted. 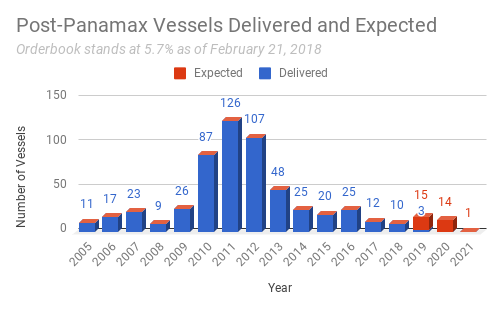 Nevertheless, all of this has taken its toll on the dry bulk segment. 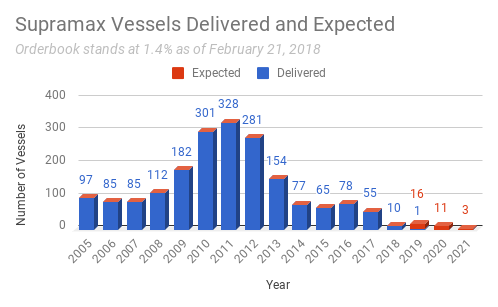 Vessel spot rates have fallen below OPEX to the lowest levels in over two years for some classes. Here, we take a look at the dry bulk shippers who specialize in transporting cargoes such as iron ore, coal, grain and other materials around the world. The only ETF for the space is The Invesco Shipping ETF (SEA). Companies with exposure to dry bulk include Diana Shipping, Inc. (NYSE:DSX), DryShips (NASDAQ:DRYS), Eagle Bulk (NASDAQ:EGLE), Genco Shipping (NYSE:GNK), Golden Ocean Group Ltd. (NASDAQ:GOGL), Navios Maritime Holdings, Inc. (NYSE:NM), Navios Maritime Partners L.P. (NYSE:NMM), Scorpio Bulkers (NYSE:SALT), Safe Bulkers, Inc. (NYSE:SB), Star Bulk Carriers Corp. (NASDAQ:SBLK) and Ship Finance International Limited (NYSE:SFL). So is the worst behind us or is there more pain ahead? 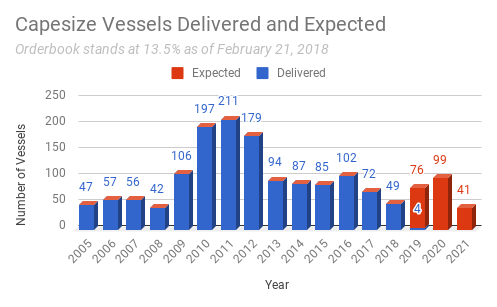 One issue brought up in previous exclusive VIE reports was the strong prospect that bulker demand growth would fall short of vessel supply growth in 2019. This imbalance would inevitably put pressure on rates. 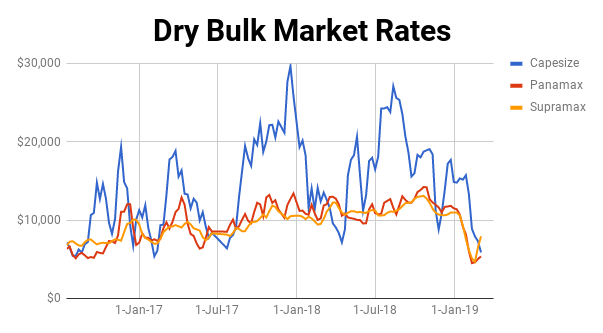 However, we have yet to see any real fleet growth in 2019 which makes the recent slide in rates all the more concerning as it stems from obvious demand side issues. It's worth noting that demand side issues are out of shipping's control. Shippers simply facilitate global trade, and even rock bottom charter rates do not inspire greater global trade volumes. As of February 21st, we had seen only a handful of expected newbuilds hit the water. 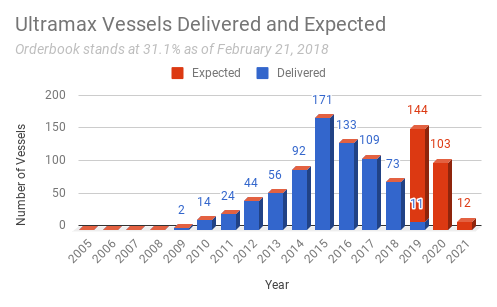 Looking back at the Capesize chart, we see that as of February 21st we had only seen 4 deliveries with 76 more vessels waiting in the wings to hit the water this year. 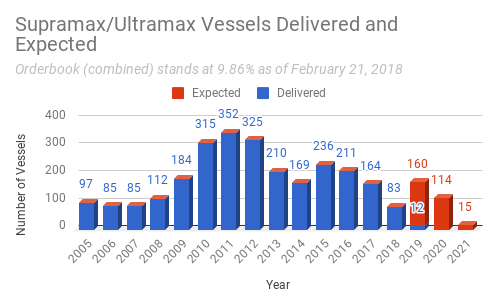 But what the vessel numbers don't show is that 17 of those remaining deliveries are actually vessels over 300k dwt, which is significantly larger than the typical 180k dwt Capesize. So in terms of capacity, 2019 looks even more daunting. 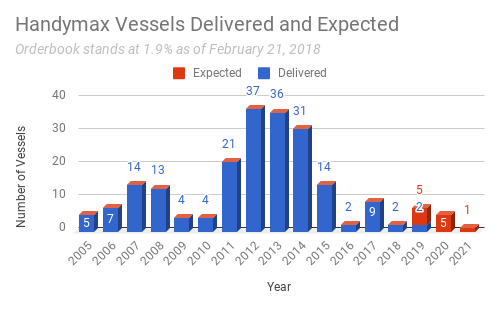 In fact, in capacity terms, the Capesize fleet is expected to add approximately 6% gross dwt over the course of 2019. Another important point is that as of that February 21st date we had seen 5 Capesize demolitions. While minuscule, this still represented negative net fleet growth at a time when rates were plunging. 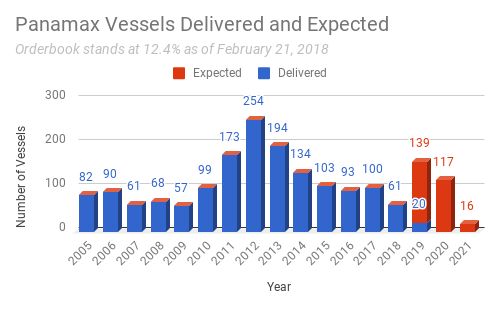 The only saving grace with the current orderbook might come as 32 of the Capesize vessels scheduled for delivery will come during the final quarter of the year. This could allow for a fair amount of slippage or perhaps come as the market experiences the impact of the 2020 Sulfur Cap which is expected to bring higher than normal scrapping as well as the potential for slow steaming. 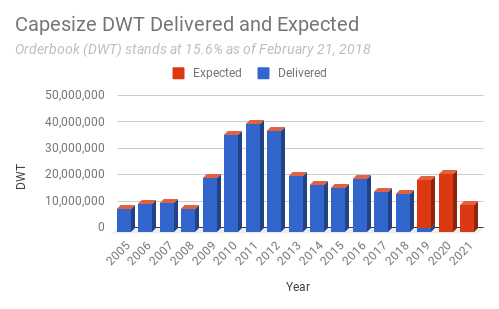 However, it is expected that slippage will be less than 2018 and demolition rates will likely not be able to achieve last years levels, unless we see a prolonged duration of exceptionally low rates. Overall, it is still expected that the dry bulk fleet will likely see slightly above 3% net fleet growth as demand side troubles grow bringing growth there to the sub 3% level. But what are those demand side issues and are they permanent or just temporary? Following the devastating dam collapse in Brazil at the end of January, Vale originally reported that 40 million tons of annual iron ore production would be impacted as they decommissioned all remaining dams. But, in early February, a court order suspended another 30 million tons of annual production at the Brucutu mine, and more recently, Vale’s Fabrica and Vargem Grande complexes were suspended. A February 15 regulation from Brazil’s National Mining Agency established plans to ban all tailings dams built with the so-called upstream method, in a process finalizing deactivation and decommissioning taking up to four years. An additional 8 million mt of seaborne Brazilian iron ore supply may be at risk of being lost in 2019 as a result of this new regulation, according to consultancy Wood Mackenzie. Vale’s rivals have said they will not be able to ramp up production to cover the shortfall and Vale's optimistic notion that increasing output from S11D can bridge the gap seems far-fetched. The first impact from this is that more Chinese iron ore imports will be originating from suppliers closer to home, which will inevitably hurt ton mile demand. Brazil is China’s second-largest iron ore supplier after Australia, accounting for 23% of the country’s total iron ore imports in 2018. For every 10 million tonnes of exports to China that shift away from Brazil to Australia, nine standard Capesize ships will be out of work. If the 10 million tonnes of exports to China from Brazil are lost forever, another five will become redundant. But also of concern is the rising price of iron ore, which comes as Chinese steel mills have been suffering from low steel margins since Q4 of 2018. Low margins could discourage Chinese steel mills from high levels of utilization. Furthermore, with lower profit margins, steel mills have also been increasing consumption of lower grade ores in place of the more expensive medium to higher grade ores, which can be sourced domestically or by utilizing existing port stocks. Finally, price increases could lead to competition from scrap as a cheaper steelmaking feedstock. Or in a worst case scenario, high input prices would translate into high steel prices and lead to demand destruction, where even a small decline in Chinese steel production removes a big chunk of seaborne iron ore demand. China recorded a 1% year over year decline in iron ore imports for 2018. Many see this as the beginning of a trend as more efficient steel production is met with a slowing Chinese economy. Iron Ore imports may start to drop at an even faster pace than we saw in 2018. 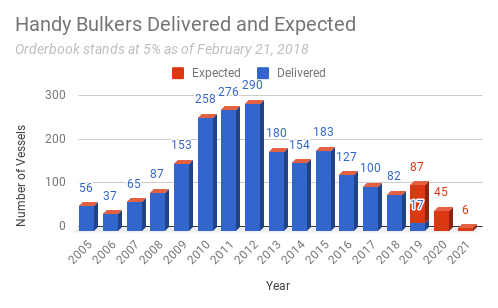 Therefore, what is usually a mega-driver for dry bulk shipping demand may start to fade and dry bulk ships will have to look for new cargoes. Now, just how important is China to shipping demand for iron ore? Well, it's time to reach back into the vault and take a look at a figure showing China's impact from 2002-2014. Notice that China was responsible for 95% of net growth in the seaborne iron ore trade. 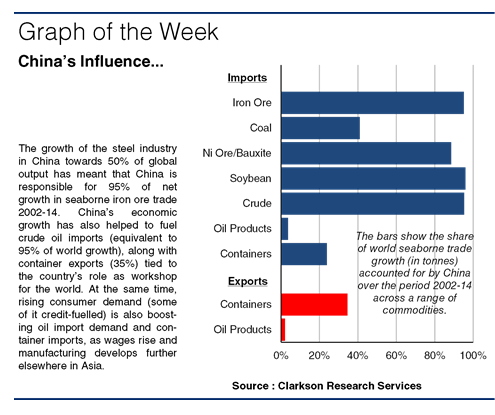 This growth in iron ore imports can be traced to infrastructure investment in construction in China. Both of which are now cooling with further stimulus measures being balanced against an increasingly concerning debt load. Now recall that China imports approximately two-thirds of the world's seaborne iron ore, so it is with great interest that we watch as the main driver in iron ore demand growth has potentially started down a path of declining import volumes. Finally, recall that iron ore composes the largest portion of dry bulk demand over any other commodity. In short, there is no escaping the reality that the Capesize market is at the mercy of China's appetite for iron ore, grade selection, and hauling distance. Yes, it's true that Chinese steel production was up in January, increasing 4.3% to 75 Mt from this time last year. But, shipments of iron ore in January were 91.26 Mt. While up from 86.65 Mt in December, they were still shy of 100.3 Mt in January of 2018, according to data from the General Administration of Customs. While January did see an overall 1% increase in global steel production, with the exception of China, the trend in Asia points towards a decline in output. India’s steel production came in at 9.2 Mt which was down 1.9% from January 2018. Japan was down 9.8% on January 2018 to 8.1 Mt and South Korea’s steel production also fell to 1.5% year on year to 6.2 Mt. Chinese coal imports grew 3.7% in 2018 to reach 281.2 million tonnes. However, this growth was tempered by government intervention. At least twice in 2018 China introduced unofficial restrictions on coal imports in a bid to prop up domestic prices by slowing down customs approvals at key ports. Similar measures were introduced at some ports last year and later lifted as demand for coal increased during the winter. They were never officially announced as China did not want to be seen to be giving domestic suppliers an advantage over foreign companies, a key criticism of the Trump administration in the ongoing trade war. But this year all that has changed and quotas are being officially announced. A quota of 12 million mt of coal was imposed on arrivals at Dalian port over February-December which is a few million mt less than the typical volume received in the same period in previous years, sources told S&P Global Platts. Additionally, it looks like the China/Australian rift is having an impact here as there have been reports of China slowing down customs clearance of Australian coal imports, with delays of at least 40 days reported across all Chinese ports, compared to around 20 days previously. Other reports seem to suggest more favorable treatment for cargoes out of Indonesia and Russia. Wood Mackenzie senior consultant Yu Zhai forecasts that China’s seaborne metallurgical coal imports will be reduced by 3 Mt in 2019 and thermal coal imports will drop by 15 Mt in 2019. As a whole, that represents an approximate 6.5% decline over 2018 volumes. Outside of China the story for coal remains the same. Phase outs in Europe and North America will be offset by introductions concentrated in Asia. Indonesia, Vietnam, Philippines, Malaysia, Pakistan and India all look to contribute to a fairly stable outlook. A sharp increase is predicted for India, with demand rising by 146 million tons coal equivalent (Mtce) to 708 Mtce in 2023, boosted by a rise in coal-fired power output and production of crude steel. Domestic mines in India have been unable to keep pace with the robust domestic demand growth leading to greater import dependency. Suffering some of the worst collateral damage in the ongoing trade war is the US/China soy trade. Volumes have dropped, trade lanes have shifted, and everyone from farmers to shippers have felt the impact. But with commodities taking center stage during the recent talks, which saw the promising sign of a further suspension of tariff increases, there is hope that not only will the dispute be resolved but perhaps more trade may actually flow. 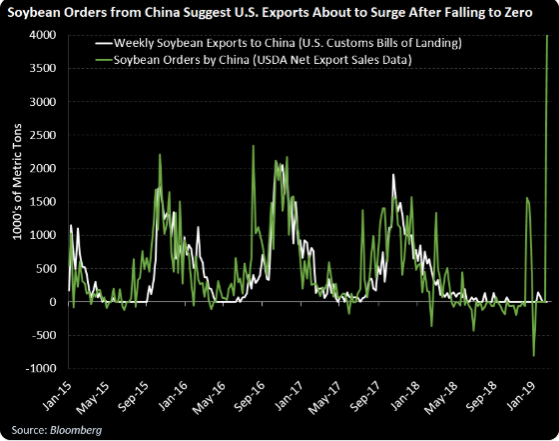 One positive development is that China committed to buy an additional 10 million tonnes of U.S. soybeans which should begin adding some support to what is traditionally the seasonally weak time of year the mid-sized vessel classes. In fact, Michael McDonough, Chief Economist over at Bloomberg recently posted this interesting graphic. But will the US/China soy trade ever return completely to its former glory? After all, some users in China have turned to other sorts of farm animal feed and Brazil has stepped in to take market share, which can be challenging in some cases to recapture. Among the ideas being floated about to bring an end to the trade war is China purchasing an additional $1.2 trillion in U.S. goods and services during the next five years in an effort to address the trade imbalance between the United States and China. That total would include $30 billion in additional purchases of U.S. commodities in each of the five years after an agreement is concluded. However, there are some that are skeptical that China can follow through on such a commitment, such as Kenneth Rapoza, Senior Contributor for Forbes who produced this enlightening article entitled There Is No Way China Is Importing $30 Billion More In U.S. Farm Goods. Of course, unless the central government stokes demand somehow, China purchasing goods from the US will in most cases come at the expense of another. So this proposal of 30 billion isn't necessarily going to inspire greater trade volumes so much as it will likely shift trading patterns. While the current downturn coincides with expected seasonal weakness, which should soon abate, it's hard to see a catalyst for a major rebound going forward. The Vale disaster is one of those unforeseen events that has the power to drastically impact the market as volumes and trade flows will be altered. Though it is a temporary issue, as Vale will likely resolve all this within the coming year, the impact on the short term market will show declining volumes in seaborne iron ore with declining ton miles. This will impact the Capesize market the most. Overall, the contribution that China's iron ore appetite was making toward dry bulk demand growth appears stalled at the moment. The robust growth that we have become accustomed to over the past 15 plus years is likely to embark on a new trend which would coincide with forecasts of peak steal production in China. Unless we see a radical economic shift or major policy change in China, with spending directed at infrastructure or construction, this could very well become the new normal and the Capesize market will be forced into an uneasy re-balancing. Coal demand will likely also impact Capesize demand as China looks to begin limiting the amount of imported volumes. Unofficial reports indicate the government is looking to place the burden of these lost volumes on Australia which has had a rocky relationship with China recently. Australia is far and away the world’s largest coal exporter and it accounts for more than 20% of China’s coal imports. However, if China’s singling out of Australian coal is true, it may be difficult for China to maintain given that the premium low-volatile hard coking coal from Australia is not easily replaceable by domestic production or other sources. This could lead to shortages or domestic price spikes beyond the levels that China wishes. The US/China soy trade was once a major growth vehicle for the midsize dry bulk classes. But China is importing less overall and the shift to Brazilian exports has had impacted ton mile demand. However, if the US and China can reach some sort of agreement this impact will likely be reversed to a large degree, and if the additional $30 billion in commodity sales is part of the end agreement we may even see some growth in this trading lane which would benefit the Panamaxes, Ultras, and Supras. Overall the potentially more permanent shift in iron ore demand looks to impact the Capesize class the most. The coal shift, which is also looks to be a long term factor, will also impact the Capesize class along with the midsize classes to some extent. Midsize classes will continue to feel the pressure from the lack of soy cargoes and the shorter ton miles, but a trade resolution here could see the return of the US/China soy trade while introducing new commodity flows into the mix, however, those new cargoes will likely come at the expense of other nations, reflecting a change in ton miles more than volumes. Therefore, it is important where those changes take place. Value Investor's Edge is a top-rated research service dedicated to offering actionable trades and strategic income opportunities. We now cover a variety of deep value and income-driven sectors, while maintaining our focus and very profitable record of shipping industry coverage. Members receive exclusive access to over a dozen reports per month, including regular shipping and commodity macro analysis from James Catlin, exclusive content by top-tier deep value analyst J Mintzmyer, industrial and MLP ideas from Michael Boyd and international insights from Ian Bezek. This winning team has developed a dedicated following of highly knowledgeable investors and industry professionals who also share their own thoughts and ideas.